NEW PRODUCT – The Art of Electronics – Student manual with exercises « Adafruit Industries – Makers, hackers, artists, designers and engineers! 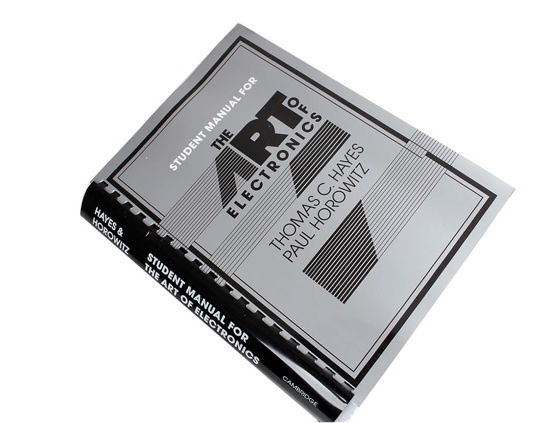 The Art of Electronics – Student manual with exercises, plastic comb binder by Thomas C. Hayes & Paul Horowitz. This manual is both a guide and aid to users of The Art of Electronics. It is carefully organized to follow the chapters of the main text, providing extra explanatory notes, worked examples, solutions to selected exercises and laboratory exercises. Learning aids such as glossaries, reading assignments, objectives, data sheets and summaries are also included. The manual is a product of many years’ teaching at Harvard University, which has given the authors direct knowledge of concepts that students find difficult. The extra explanatory detail makes this manual an essential purchase for students using The Art of Electronics. class notes explicate Text material; these notes cross-reference Text readings. Yay! This is a really good book. It takes the “f*&(ing cookbook of electronics” that is the pure, original book and converts it into enjoyable, human-readable text. Some of it is a little dated (the example code for microprocessor section in particular,) but it is still a very useful book. I’ve wanted a copy of The Are of Electronics for a long time now, and now I want to get this to go along with it. Awesome product!